There are a few general points of interest that do not belong in the more special departments of the preceding chapters and they justify, I think, a brief one of their own. warns the children of a coming danger and often knows of their unexpected danger when they are at a distance. She is generally clairvoyant but it is a casual sort of thing with her. No. 6 informs us that his mother had one veridical spontaneous psychic experience, a visual hallucination of a brother being wounded in France and carried off the field, with close time and fact coincidence. Her sister was given, in life, to veridical dreams concerning relatives particularly. Although No. 7 himself has had an hallucinatory experience of his deceased grandfather's voice, he can credit his mother only with being unusually "intuitional"; the mother says playfully that she is clairvoyant. No striking experiences can be related, however. No. 8 has an aunt and grandparent on the mother's side who have had parapsychic experiences in connection with religious experiences. The mother herself is very intuitive, especially on character-judgment. It must be emphasized strongly that these subjects are all normal, healthy, intelligent young men and women, not peculiar in any way and without pathological heredity, so far as they know. that the drug and fatigue data seemed to indicate that E.S.P. may be a higher, more complex development than sensory perception, and, the suggestion follows logically, is probably a later development in mental and cerebral evolution. This is unfavorable to the view held by some without even this amount of facts to support it, that E.S.P., in man, is an atavism. The extent and level of E.S.P. in our own species constitute points of importance. We cannot say how large a percentage of people are capable of E.S.P. until we have tried larger numbers under good conditions. There is no ground for a decision, as we now can see, in a few tests given in a classroom, or under any other conditions preventing abstraction. Even our best subjects cannot succeed under such conditions after months of experience at the work. Negative results are never final. It is impossible, with our present knowledge, to know if the conditions are adequate for judgment. But some small notion of the number of good E.S.P. subjects existing 1 may be gained from the facts on our own departmental students. Of the 14 graduate students in psychology present in the last two years, 6 have shown E.S.P. ability that is statistically significant. One other has been reported to have done work appreciably significant but I do not have his results. There are 7 others remaining. These have never been tested, to my knowledge. But even allowing for no ability in the remaining half, we have 50%. Will some one say that psychology students are a select lot? Estabrooks said he found them singularly poor as subjects; they were too introspective. conditions required may conceal it from our tests—even without preventing its functioning in the freer circumstances of daily life. Among the better subjects there is what may well be a kind of "species level". They mostly score on an average of between 8 and 11 per 25, both P.T. and P.C., if conditions are good. See column 3 of Table XLII. All 8 subjects do this, except when a disturbing factor enters, as illness, drugs or a decline of E.S.P. capacity (as with Linzmayer and Stuart). If we take the total normal scores of the 8 major subjects (before they began to decline in the cases of Linzmayer and Stuart) and leave out drug, illness, D.T. and other special data that do not represent the regular function of E.S.P., we get only one exception. This is Zirkle, who is unusually high on P.T. and not significantly above chance on P.C. If we include the P.T. work done during his long, mild illness (2,700 trials), his score average drops within the range indicated, 10.7, but this would, of course, not be justifiable. 1st 600 trials before decline. 1st 500 trials before decline. All B.T. trials up to 4-1-33. All E.S.P. trials to 4-1-33; no decline. B.T. and P.T. trials; no decline. P.T. only; health good; no decline. B.T. and P.T. ; no decline. perceptual range, like the species range of sound or light perception. This is, of course, speculative analogy, representing a beginning of inquiry rather than a conclusion. The subjects can all "jump" this "species wall" for short periods, as in the occasional very high scores, even ascending to 25 consecutive successes, but for the averages and the long runs, the "species range" of from 8 to 11 seems to be (excepting Zirkle) the natural level. Of the two conditions, the P.C. remains the more stable. P.T. varies more widely; it has two human variables and two E.S.P. elements probably at work. The decline of Linzmayer began in June, 1931, with my urging him to work against his obvious wish to leave. He ran below chance then, as I had expected and hoped he would do. This was, however, a great strain for him, and perhaps the ruthlessness of the method permanently injured his capacity for E.S.P. by inducing strained or unwholesome memories and attitudes. He is still interested, but I think that possibly he can never really feel the same toward the experimenter and his plans; he has also a strong negativism of which he is hardly conscious (but which is apparent in hypnotic tests), which may be activated to cause a certain conflict and oppose the abstraction necessary for high scoring. Failure is very discouraging to Linzmayer, and he has become more and more chagrined by his inability to return to his original level. This makes it still harder for him to "concentrate" and so the "vicious circle" of decline goes on. 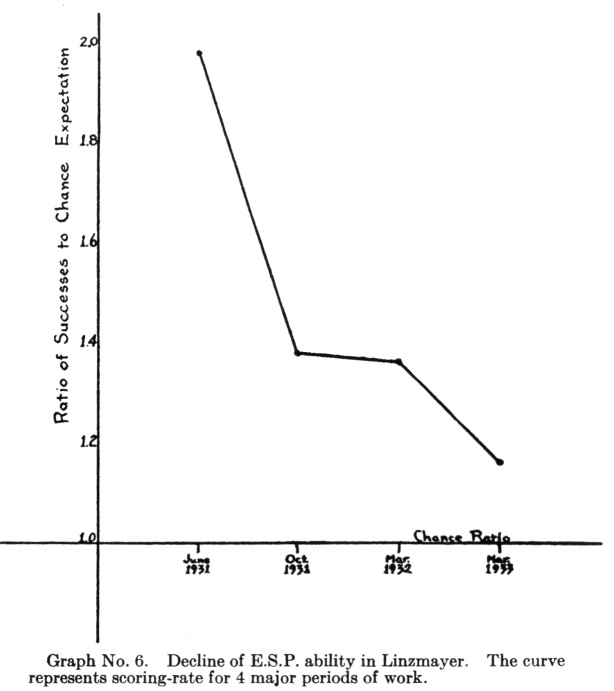 His "decline curve" is given in Graph No. 6, representing the four periods of work he has gone through, omitting the purposively planned low-scoring period mentioned. For the fuller data see Table XII in Chapter 5. The averages per 25 trials dropped as follows: 9.9, 6.9, 6.8, 5.8. Graph No. 6. Decline of E.S.P. ability in Linzmayer. The curve represents scoring-rate for 4 major periods of work. [paragraph continues] 5 groups of 1,500 runs each, is as follows, in averages per 25 trials: 7.1, 6.1, 5.7, 5.9, 5.4. See Graph No. 7, A. On the return to scoring, while the graph shows the B curve starting higher than the A, Stuart really did not rise in the second period to the level of the original 500. 7.3 was the highest he made for as many as 400 trials. For about the same number of trials he held up above 7.0, both times and then dropped to around 6.0. Graph No. 7. 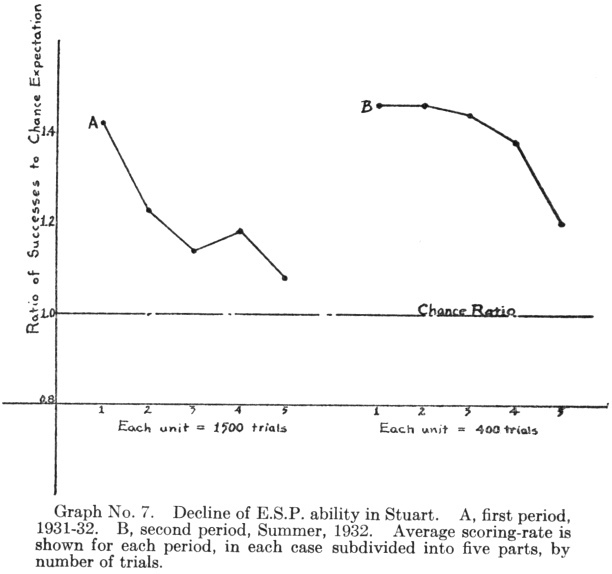 Decline of E.S.P. ability in Stuart. A, first period, 1931-32. B, second period, Summer, 1932. Average scoring-rate is shown for each period, in each case subdivided into five parts, by number of trials. became a little tired of the business and needed a rest from it. Let the reader try 7,500 trials, if he doubts the need for a rest and change of scene. This view may not be correct, but it is both an adequate hypothesis and a probable situation. At the end of the 7,500, when he complained of low scoring and I suggested he might be bored with the business, he admitted that he might need a change. Only a few months later he returned to a level of 7.3 but has not yet come back to 9.0 in 25. [paragraph continues] (Miss Weckesser and Pratt, for example), have declined to a "chance level", how permanently we do not yet know. But the majority of the major subjects are holding up very well, with no serious signs of decline. (Just at the moment of writing this I am informed that Pearce, who has worked more than any other subject, has scored 11 and 9 in two runs of P.C. with the cards in one building and himself in another, 250 yards away. A few days ago he finished a series at 100 yards with 13, 13, 12. He is evidently not in danger of running down.) This is important not only in its experimental convenience and not merely as a further fact in the psychology of the E.S.P. processes, but in the general biology of E.S.P., with which we are at the moment most concerned. For E.S.P. is a biological phenomenon and one that might obviously be of tremendous value to the species. To the hunter, the warrior, the seaman—in fact, to most all life situations—E.S.P. might serve in many ways to give man an important margin of advantage over his enemies and his environment in general, so that the question of its permanence is most serious. Were it characteristically to flit in and out of functioning, its biological significance would be reduced almost to nothing. But if it does, as we find, only relatively rarely decline (if, indeed, it has not merely declined for our particular experimental situation), we can regard it as having biological survival value to any species possessing it. In homing, migration, food-seeking, mating and all the processes where cognition is a primary essential this mode of perception might be of value, if it exists and functions in the species. The fact, however, that it has not been more clearly observed in the many observations made on animals would seem to exclude it from any considerable importance to animal existence. Or could it be that it has not been seen because it has not been looked for? In our own species, however, extra-sensory perception occurs and may be demonstrated in many normal people in undeniable fashion. In the light of the foregoing observations, it seems to be a fairly dependable and persistent capacity, when it is given proper conditions for its functioning. These are facts which any comprehensive biology must face and study, if it is to treat faithfully of the natural history of our species. 155:1 Another instance of relation between E.S.P. ability and general parapsychology has been found recently. Mr. Finan, another of our graduate assistants, stated to Mr. Stuart that he came from a "psychic" family. Stuart forthwith tested him at B.T. and he scored 8. Finan asked to go to another room alone and, thus remote from the cards, he next got 12, a very unusual start. His later work has been poorer, but he still shows some E.S.P. ability. 155:2 See page 22, Chapter 2. 156:1 I now have more subjects than I can myself work with; the experimentation needs institutionalizing; i.e., needs special endowment and special assistants. No one individual can manage it adequately.